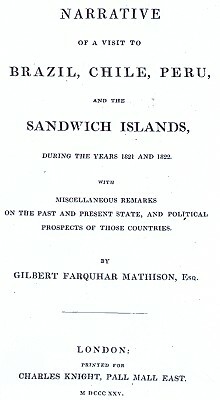 Gilbert Farquar Mathison : Peru and Sandwich Islands, 1822. During the years 1821 and 1822. Charles Knight, London, 1825, pages 15. Although not specifically recording surfriding, this work is notable for illustrating that the attraction of the surf was still a powerful influence despite the increasing power of Christianity. Visit to public baths at Lima, Peru. Visit to Chorillos, Lima's bathing resort, but out of season. The natives regarded us every where with much curiosity; they appeared remarkably kind and friendly, and readily accompanied us as guides. have gardens containing melons, water-melons, and sweet potatoes. The King occasionally resides here, and considers it a sort of wateringplace. It is situated in the midst of a thick grove of fine cocoa-nut trees growing along the sea-shore, and offers many advantages for fishing. We saw a great many canoes drawn up regularly on the beach, and others upon the sea with fishermen in them. Women and children were amusing themselves in the surf, and apparently giving way to unrestrained exuberance of animal spirits. Immediately above us towered a rocky hill and promontory called Diamond Point, which juts out into the sea, and forms a conspicuous and fine object, while the horizon was richly and beautifully illuminated by the rays of a setting sun. Two or three times a day the whole party of natives, male and female, repaired to the river, and amused themselves with bathing. The women are excellent swimmers and divers, to which they are habituated from their earliest childhood, insomuch that one would almost think the water was their natural element. I attended Divine service, and heard a very good discourse delivered by Mr. Bingham. Not many of the white residents were present, and but few natives. Kaahumanu, one of the chieftainesses, and a sister of Coxe, who had distinguished herself some time before in burning the few remaining idols and destroying every vestige of idolatry at Owhyhee, was specially invited, and had promised to attend. A sudden whim, however, seized her, to go to Whyteete; and there she spent the day, bathing, and playing in the surf with a host of equally frolicksome companions. Coxe, who had now returned from Why-arouah, also promised to attend, but was obliged to stay away in consequence of sudden illness. On the afternoon of this day, having taken in all our freight of sandaI-wood, and made every preliminary arrangement, we finally left Woahoo and the Sandwich Islands, in company with the American ship Howqua, and pursued our voyage over the Pacific Ocean to Canton. I took an affectionate leave of the Missionaries, andleft them my best wisbes for the success of their disinterested and benevolent undertaking. I carried. away ,with me a grateful recollection also of the attentions and bospitality I had invariably experienced at tbe hands of the American Consul and other white residents, as well as the native population. The King and one of his Queens paid us a fareweIl visit on board just before our departure; and, we in return did our best to entertain them in their favourite way, with wine, spirits, &c.
asleep, their attendants in the mean time standing over them as usual with fans to brush away the flies, and singing their own wild, inharmonious lullaby. At last the ship got under weigh, and we were obliged to rouse our royal visitors rather unceremoniously from their slumbers, that they might take their departure, which they accordingly did; and we exchanged for the last time the friendly salutation of 'Ar-ro-ha' with much mutual cordiality. Between twenty and thirty females, who had been living on board with the sailors, according to immemorial usage, still remained, and seemed unwilling to quit the ship. At length, when we had advanced about a mile out of the harbour, they took a most tender leave of their respective sweet- hearts, and with loud laughter and cries, and huzzas from the crew, leaped overboard in one instant into the sea. There they remained swimming and diving, and playing about the ship, like so many mermaids in their native element, until a breeze sprung up; and as we bounded merrily before it, women and canoes, and houses and the land itself, gradually disappeared from our view. Geoff Cater (2010) : Gibert F. Mathison : Peru and Sandwich Islands, 1822.